So far this weekend of the World Championship has been about the culmination of the Magic year—sunsetting Dominaria Limited and the Core Set 2019 Standard, before looking to the future. But now, at the 2017–18 Team Series Championship, it was all about these two titanic teams locked in combat with the new set and new cards. It's the first showcase of Guilds of Ravnica and what a showcase it is—a Team Sealed on the highest level of competition. 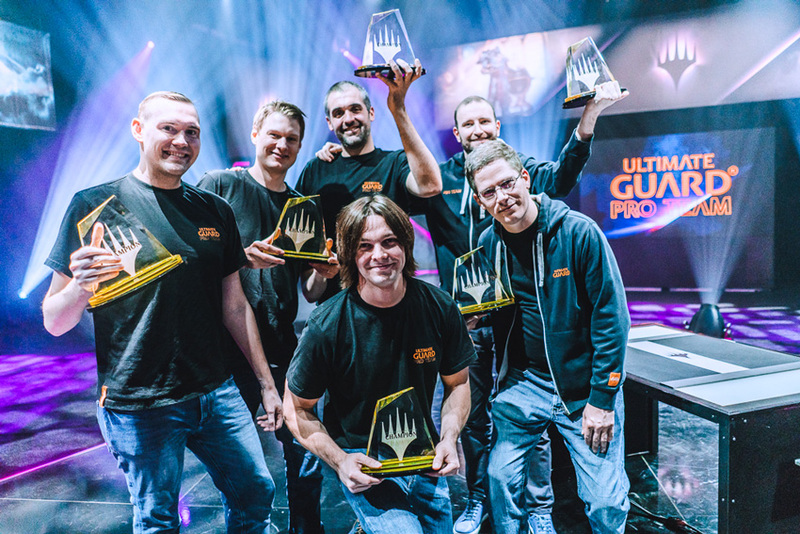 Throughout the season, these two teams—Hareruya Latin and Ultimate Guard Pro Team—consistently performed on the main stage of the Pro Tour, and they earned the right to compete for this prestigious title. Both teams were testing all week—getting the first and only glimpses of the brand-new Guilds of Ravnica before competing on the biggest Magic stage in the world. Hareruya Latin is chock-full of the best pros from South America, Portugal, and Spain. Pro Tour Winner Lucas Esper Berthoud, former Draft Master and 2016 World Championship finalist Márcio Carvalho, former Standard Master Sebastian Pozzo, 2002 World Championship and Pro Tour 25th Anniversary Top 4 finisher Carlos Romão, Pro Tour Champion Luis Salvatto, and two-time Pro Tour Top 8 finisher Thiago Saporito bring plenty of individual bona fides to the table. But it's their unification as a team that brought them here. Posting amazing finishes in the first team Pro Tour in over a decade—Pro Tour 25th Anniversary—Hareruya Latin did better than solidifying their 2nd-place status, and earned nearly 100 points to become the first seed and earn a spot here this weekend. Though they are a stellar team, and clearly one of the best in the world, they came to this stage unexpected underdogs to one of the only teams that could possibly overshadow them. Ultimate Guard Pro Team may be the most illustrious and well-known Magic players of all time—boasting four Pro Tour Hall of Fame members and combined lifetime Magic earnings of nearly $2 million (breaking that threshold with a win here). The team is headlined by "The GOAT" (with sixteen Pro Tour Top 8s) Jon Finkel, but the remaining members are almost as illustrious: two-time Pro Tour Top 8 finisher Andrew Cuneo, World Championship finalist and former Magic Online Champion Reid Duke, reigning World Champion and Pro Tour Champion William "Huey" Jensen, Pro Tour Champion Paul Rietzl, and two-time Player of the Year and World Championship finalist Owen Turtenwald. Though all six players had disappointing finishes at the latest Pro Tour, they were far ahead in first place for much of the year, and clinched a spot in the finals despite being leapfrogged for the one seed. This morning, the teams received their pools and had an unprecedented 2 hours to build the six total team decks. That time did not at all go to waste, as both teams used the bulk of their 2 hours intensely working together and debating on how best to craft both of the three-deck pools. Because the cards are so new, the players haven't discussed their opinions and insights on every single card. 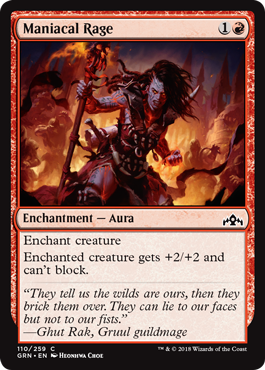 But in Team Sealed—more so than any other format—all cards have to be considered. In both team rooms, one of the hottest debates was about the card Maniacal Rage. Independently both teams fiercely debated whether their respective Boros lists were "Sure Strike" lists or "Maniacal Rage" lists. "We're a Maniacal Rage deck; we have no hope for an end game," Turtenwald had said. Sebastian Pozzo talked about the pseudo-Pacifism effect when you cast the card on an opposing creature to sneak through the final points of damage. This was an extremely relevant debate—Hareruya Latin said in their testing that Boros and Dimir are almost always two of the three decks built—so optimally leveraging a Boros deck is a key skill in Guilds of Ravnica Team Limited. This played out for Ultimate Guard Pro Team as well, as both sets of players wound up with a Boros deck. Reid Duke had mentioned feeling "locked in" to red and white given their card distribution. Pro Tour winner Lucas Esper Berthoud talked about the latest pools saying, "We don't feel like we have a particularly good pool, so we built two aggro decks to try and maximize our wins, be we still don't know about the third deck." Hareruya Latin concluded that green was the worst color for Team Sealed specifically, as "It often wants to be four-color or five-color, and you can't take all the best cards from your other decks." Additionally, because in Team Sealed the larger card pool means the flier-heavy colors definitely get all the sky-high cards they need, the ground-bound green creatures are at a bigger disadvantage than usual. But this didn't stop Berthoud from brewing up a spicy Golgari aggro deck. The guild has proven the trickiest to make work in Limited for the teams—lining up undergrowth enablers with payoffs can make for inconsistent draws, but when it works it really works. The team also spent a lot of time discussing Thiago Saporito's Selesnya build. Missing any real windmill slams, the team debated the best way to proceed. "No, you need the tricks," Márcio Carvalho said emphatically. "Look, if you don't have any tricks, you're [not in an advantageous position]. Yes, you can provoke blocks, but sometimes they are just going to double-block. You need tricks because those double- and triple-blocks will be terrible without backup." Pozzo implored later, "But if you're attacking with all that, you're already winning." "Maybe. Maybe not," Carvalho replied, summing up the nervous discussion among the team trying to grapple with the below-par pool. Going back to Ultimate Guard Pro Team, Cuneo, Rietzl, and Finkel's team decks were slightly easier to build, but despite being a helpful teammate, William Jensen was nervous about his, Duke's, and Turtenwald's pool builds. Turning away from the simpler pool at one point, he said, "At least with this pool we know what decks we're playing. Over here, we have no idea ... Jon's been over here for like an hour and still has no idea." After clapping emphatically, Turtenwald replied, jocular, "We've got a new A team, boys!" When everyone turned their attention to the problem pool, Rietzl took one look at Turtenwald's Boros deck and declared, "You can have this card. Boros deck doesn't want removal," tossing a premium removal spell from Turtenwald's pile to Duke's, much to the confused consternation of the rest of the team. After a moment of staring, Rietzl course-corrected. "Boros deck wants removal back." The team did eventually figure out how to build the pool, but Jensen's deck was still the problem child. After over 80 minutes, Jensen was still so unsure about his build he went to every other team member to get their personal sign-off on his four-color control deck. Everyone agreed the power was there, but with so many directions to go, even the best in the world weren't sure of their final lists. Hareruya Latin also eventually settled on builds. Berthoud's was the most problematic, but in the end they trusted and relied on each other's expertise. At one point, registering his list, Berthoud held up Underworld Uprising and asked, "Márcio, when did this card end up in my deck?!" Carvalho replied, "Very late. It'll be good, I promise," and Berthoud registered the card. The biggest difference in testing was Ultimate Guard's hyper focus on sideboards. They argued that because which decks you will see on the other side of the table are predictable, it was extremely important to have a sideboard plan against each one. The team spent a lot of them divvying up the non-main deck cards, hoping to shore up bad match ups in the second and third games. After the 2 hours were up, the teams met on the illustrious stage, ready to clash for the trophies. It was first to two sets. If the teams split the first two sets, the winning groups would play a third set to decide the title. In the first game of the first match, Carlos Romão and Jon Finkel were locked in a Dimir mirror match. It was unsurprising that these players would be on the blue and black control deck, especially Romão, who won the World Championship in 2002 playing a Psychatog control deck of the same colors. Romão got off to a slow start, and Finkel attacked consistently, building his board with things like Nightveil Predator and Thoughtbound Phantasm, with the spells to make the Spirit more than ephemeral. But Romão was unperturbed. His hand was staid, as he tried to leverage Murmuring Mystic to its fullest extent. He used Quasiduplicate to make a second copy, then cast multiple instants and sorceries to create an army of Illusions. This would usually take over an entire board, but Romão merely used it to gang-block a hexproof flier, and quietly reverse his fortunes. He didn't get ahead, but he was no longer behind. After that turn, Finkel drew little help, and Romão turned a dire situation into a winning one. Gaining more advantage on the board, Romão attacked more aggressively than he often does while playing control in Constructed—playing slightly less safe to close out the game before Finkel could draw relevant spells. And though Finkel did find a Doom Whisperer, Romão was prepared and on the last attack step used an unlikely mode of a removal spell—targeting his own creature—to allow his Piston-Fist Cyclops to attack through for the win. It was important that Romão had taken that first game, as both his teammates lost, so Hareruya Latin was going into the second games down 2-1. Jumping over to the next seat was Pro Tour Hall of Famer Paul Rietzl for Ultimate Guard Pro Team against Thiago Saporito for Hareruya Latin. Rietzl had taken a fast Game 1, and in the second started the same way. Two Skylight Legionnaire put the pressure on Saporito's ground-based Selesnya deck. With Justice Strike and Inescapable Blaze awaiting in his hand, Saporito was on the ropes, often looking up at the roof and frequently blinking, as if to say, "Why did I have to get the Boros match?" With Saporito at 10 life, Rietzl started going for the dome with Inescapable Blaze. That spelled the end. And just like that, Ultimate Guard Pro Team had claimed the first point. With Andrew Cuneo already up a game, if he could take the second off Márcio Carvalho, the first set would come to a swift conclusion. In that match, the Selesnya and Boros archetypes were reversed. Carvalho's Boros was not close to as fast as Rietzl's (Carvalho had called it a "bad Boros deck" during build), so he had to rely of evasive fliers to race above Cuneo while trying to keep Cuneo's ground-pounders at bay—which hadn't worked at all in the first game. Early on in the second, Cuneo built an impressive, imposing board with Carvalho falling deeply behind again. But a perfectly executed Sure Strike put the Portuguese player back in the game. Even though Carvalho tried to battle back, ultimately his bad Boros deck behaved badly, and Cuneo scored the winning point for his team. Ultimate Guard Pro Team took the first set in convincing fashion, only dropping one game. It was now their finals to lose going into the second set of matches. And as Jon Finkel said between rounds, having to rely on Peach Garden Oath, the winningest team in Magic, isn't that nerve-wracking to do. This match started with a game between a former Player of the Year Owen Turtenwald and a player currently in a run-off for Player of the Year, Luis Salvatto. Turtenwald's Boros deck came out fast and strong with the most hotly debated card in the pools—Maniacal Rage. Rietzl had been the strongest voice for the card, and Turtenwald seemed happy to be playing it here. But Salvatto's Izzet deck put up the defenses exactly as it intends—allowing him to get to the mid game and start out-drawing and out-surveilling his opponent. Turtenwald had gotten the early damage, but a key Capture Sphere and a Chemister's Insight (or two, thanks to jump-start), quickly took the game out of reach for Turtenwald and into Salvatto's hands. Though Salvatto was already in the clear, the big nail in the coffin came in the form of Niv Mizzet, Parun. At that point, the game was just looking like it was fun for Salvatto. Turtenwald is not one to concede, but the draw-loving Dragon helped Salvatto take the win. This game was indicative of the rest of the team. Hareruya Latin had a first-round sweep, going into the second games a clear 3-0. People were particularly surprised by Sebastian Pozzo taking the first game off Reid Duke, as Pozzo's Boros deck was just full of fast but very mediocre creatures. For the next game, the camera investigated. In the next series of games, we saw Sebastian Pozzo against Reid Duke. Pozzo had a "Boros deck with very bad creatures," he'd said. But much to people's surprise (including Pozzo's) he took an easy Game 1 off Duke and was playing now for the match. Though Pozzo started behind to Duke's Selesnya early on, Pozzo's unorthodox play of pumping Duke's creature so that it died to Citywide Bust put him right back in the game. After that, Pozzo leveraged the activated ability of Legion Guildmage to keep Duke's best creature locked down and maintain board supremacy despite Duke's defenses. In the last moments, Duke finally found the Prey Upon to remove the problematic mage, but it wasn't enough, and Pozzo took the match in convincing fashion. And now the shoes were on the other feet. It was Ultimate Guard Pro Team and Peach Garden Oath with toes in the fire; one more loss from either Turtenwald or Jensen and the finals would go to a third set. The ball was in William Jensen's court against Lucas Esper Berthoud, but Berthoud was already up a game—and Jensen was not confident in his greedy Dimir-double-splashing build. Berthoud's Golgari Aggro and done all the cool Golgari things in the first game while keeping the pressure on, so Jensen was really on the ropes. But in the second game, Berthoud's deck found itself in the exact situation that the rest of Hareruya Latin had desperately feared—an opponent with a wall of creatures, that the little black-green critters were ill-equipped to deal with. Jensen, with a back-up counterspell in his hand, effortlessly pressured Berthoud with a Watcher in the Mist (and a second waiting in the wings). He made the whole thing look easy. When Jensen surveiled into his Ral, Izzet Viceroy, he solidified the win. It took him about seven turns after that, but make no mistake, it was this moment wherein he won the game to even the score. With Jensen staving off death for Peach Garden Oath, the match moved to the rubber game between Salvatto and Turtenwald, after Owen had taken Game 2 himself to force a third game. This match really highlighted the potential power of the most disputed card of the Sealed Pools—Maniacal Rage. Showing no fear at all, even into potential removal, bounce, whatever, Turtenwald cast an early enchantment and just went to town. Salvatto tried to stabilize, but Turtenwald kept coming fast and furious. And while suppressing his own maniacal laugh, Turtenwald swung for the win and forced a final match. Now it all came down to Jensen, and his powerful deck against Berthoud's Golgari machine. With their backs against the wall, unable to lose one more game, Peach Garden Oath delivered in the clutch and drove the series to this final game. Even though the setup for the final game was a nail-biter, the execution was more perfunctory—more consistent, solid, control-deck Magic from outgoing World Champion William "Huey" Jensen that all but made a mockery of Berthoud's Golgari deck this time out. Jensen had all the answers and played methodically, like an anaconda slowly strangling its victim. Berthoud's deck's synergy never coalesced—getting the payoff cards before his set-up ones, and never drawing the removal when he needed it. This allowed Peach Garden Oath to secure the win for Ultimate Guard Pro Team in the 2017–18 Team Series Championship! Ultimate Guard Pro Team have defeated Hareruya Latin to become the 2018 Team Series Champions!